Investors Realty was created by Jerry Heinrichs and Steve Farrell – the idea started over drinks! 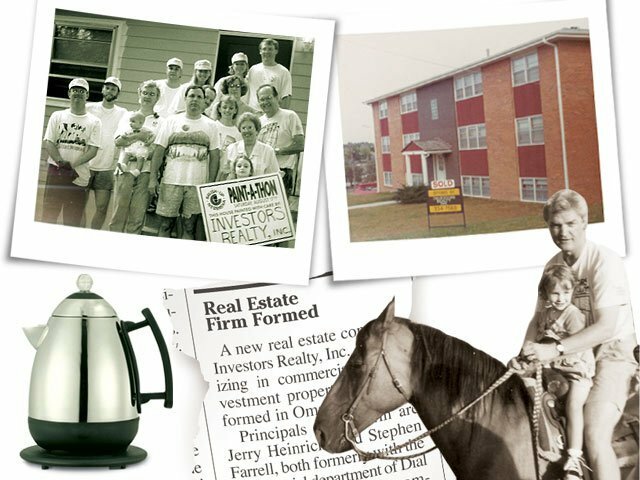 Their first lease was written on a napkin and their first office purchase was a coffee pot. First office opened at 115th & Davenport with three brokers and one secretary. Original Goals: Create local small investment partnerships, increase net worth and have fun! Culture: Always put the client first and the money will follow. No titles were given. Continuous education was a must. Hired Chris Sailors as the secretary, bookkeeper and receptionist. Chris just retired in 2012. Moved office to FW Bank Building at 108th and West Dodge Road (now the Two Old Mill building). Built current location at 11301 Davenport Street, which housed six tenants when Investors Realty moved in. Increased team to six brokers. Added Property Management department with one manager. R.J. Neary joined as a broker and partner. Jerry left for Mid-America REIT. John Dickerson joined the firm as Director of Property Management. Jerry returned to Investors Realty as a broker. We celebrated our 25-year anniversary. The firm became full service including: brokerage, brokerage assistants, property managers, maintenance and accounting. A consultant helped Investors Realty become more sector-specific and improve property marketing packages. Steve Forbes moved from working as a broker in the 90s and later a business development and project coordinator to advancing the company in IT, marketing and reporting. New positions for IT, marketing and management were created as Investors grew and gained a broader clientele. Steve Farrell stepped down as President, replaced by R.J. Neary. (Titles still do not affect how teams interact and are just for corporation status. )Tim Kerrigan named as Vice President. and support staff. Completed 10,000th transaction. Property Management now manages over four million square feet.